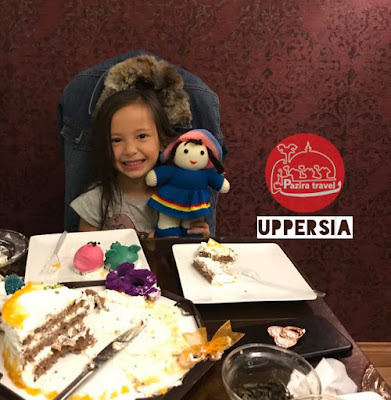 Uppersia Iran Travel blog: Is Iran a safe destination for kids? As the number of travelers visiting Iran is rising, we see more and more kids coming to Iran with their parents. This proves that as an uncovered destination, Iran is safe and sound. The outstanding attractions of Iran like the legendary Sphinx and Griffins and other imaginary ornaments in Persepolis, the happy contrast of pink and yellow and floral forms on the tile works of old mosques in Shiraz or Isfahan and the endless deserts like Shahdad, Mesr and etc, providing kids a land for jumping and running around will cause “the trip to Iran” to be saved as a fun memory in Kids’ creative and welcoming mind. Sunny beaches and dolphin parks of Kish and Qeshm in the south of Iran, horse back riding and cycling clubs and also thrilling activities like zip lining which are available in most of the cities in Iran are activities suitable for more naughty and energetic kids. On the other hand, the verity of nutritious foods and fruits in Iran can keep the kids satisfied even the ones with eating disorders. Delicious sweets made with organic ingredients like Iranian Saffron ice cream full of nuts, Pashmak which is similar to cotton candy or the sour snacks like fruit rolls made with fresh plums and Ghare Ghorut (Black Kashk) a very sour diary rich in Calcium are some of the snacks driving the kids nuts! So don’t mind finding a baby sitter and be sure that your children are going to have an awesome time here in Iran. Considering the sunshine in Iran, do not forget to take a suitable hat and sunscreen for the kids.